We provide dedicated on-site service to offer installation, training and maintenance on all of your products and systems. For a limited time, get big savings on our Wireless Digital 5‑Clock Starter Package, now just $2,695. Put an end to “Buddy Punching” with Owl Time Clock’s Biometric Hand Punch Clock. Combine with our Clock in the Box™ software to provide you with better control of your labour expenses and employee productivity. 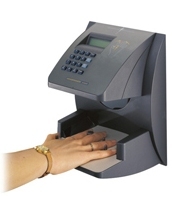 Learn more about how our Biometric Hand Punch Clock can save your company time and money. Our Clock in the Box™ Time & Attendance System is a complete employee time-keeping solution with software and hardware right in the clock! How Much Money Can I Save with Owl Time Clock? Try our quick and accurate savings calculator to see just how much money you will save with a Time & Attendance System.